BA9S LED bulbs known as MBC (aka 1445) with single contact and level pins, replacement for car type bulbs. 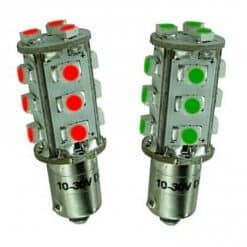 Here we have a wide selection of BA9S LED bulbs which have the miniature 9mm diameter base, level bayonet pins and a single contact at the bottom. 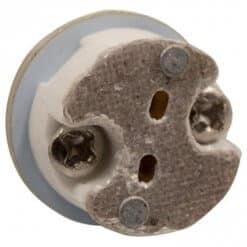 Many boat lamps and marine light fittings use the Single Contact BA9S Minature Bayonet Cap (MBC) bulbs found in many Navigation lights such as the Davis Megalight or Hella (series 20) anchor light fittings. 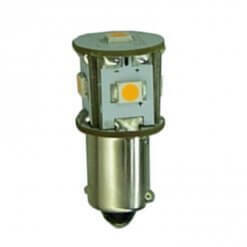 The BA9S LED bulbs are ideal for boats, trains and motorhomes and can be used on both 12 volt and 24 volt electrical systems and withstand fast charge charging voltages, voltage surges and common voltage spikes, they have no polarity considerations and consume a fraction of the power of the Tungsten original (typically a tenth). 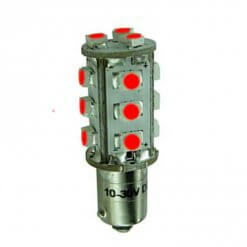 They are available in Warm White or Cool White across the range and Red or Green in the brighter versions.